News | GraphoLearn | Evidence-based learning game helps children to learn to read. 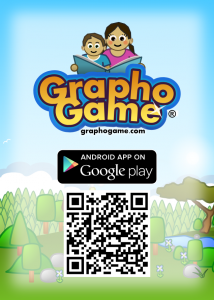 The GraphoGame mobile learning game can teach the basics of reading in different languages. Our intention is to launch 10+ GraphoGame language versions starting from year 2016. The game is fun to play and engaging for the intended age group of 5 to 9 year old children. All these children could get a great start by learning to read with our GraphoGame method! Now, how cool is that? And what we have in our hands is not just a vision or a “minimum viable product”. The method is already in use in Finland since 2007, with more than 300 000 registered users. The Finnish little brother of GraphoGame is called Ekapeli, the “first game” that all Finnish children use in school or at home to learn the basics of reading. The service is supported in Finland by the Ministry of Education and Culture. Now you have the opportunity to meet us in Helsinki, Finland, Slush this wednesday 11.11.2015 at 16:00-18:00 at the demo area A1-A2. And please sign up to our newsletter for upcoming releases! Professor Heikki Lyytinen has participated at the China’s Fourth International Early Childhood Development and Poverty Reduction Summit and 2015 Asia-Pacific Regional ECD Conference in Beijing, 21-24th October, 2015 . His presentation in the session about Technology and Interactive Media in Early Childhood Development can be downloaded here . The International Literacy Day celebrations are taking place all over the world to highlight the meaning and importance of reading, a life-saving skill and a fundamental human right. We interviewed Professor Heikki Lyytinen about his work and plans for the future. See all videos here. Professor Heikki Lyytinen participates the literacy day event at Lukukeskus and is the keynote speaker in Tampere at the 5th Conference of the European Societies of Neuropsychology on Wednesday the 9th September, 2015. Our study aimed to compare a grapho-phonemic program, the GraphoGame (Lyytinen, Erskine, Kujala, Ojanen, & Richardson, 2009), with a cognitive program, the PREP: PASS Reading Enhancement Program (Papadopoulos, Das, Parrila, & Kirby, 2003), for the enhancement of reading performance in early school years (age 6, Grade 1). For the purposes of the study, Graphogame was adapted and piloted in Greek, a language with a transparent orthography such as Finnish, as a web-based intervention. Moreover, an electronic version of the PREP program was designed and developed. Results revealed that children in the GraphoGame group showed sizable improvements in phonological, naming, cognitive, reading, and orthographic processing skills over time. The development in these abilities was comparable to the development seen in the CA-C group, after controlling for their initial score, which was far faster than what would be expected over participants’ school careers. The new and interesting finding is that this improvement was also observed when the two types of interventions were delivered in combination. We also developed and applied a novel computational framework for microgenetic analysis (e.g., Siegler, 2007) to accurately describe development through intervention and to collect information regarding how the anticipated improvement was produced in the participant-treatment interaction. Traditionally, the efficacy of reading remediation programs has been determined by comparing participants’ performance to controls in measures of cognitive, linguistic, reading, and orthographic processing skills at pre-, mid-, and post-intervention assessments. However, computerized implementation of the remedial programs goes a step further and enables recording of microgenetic data during intervention. Results showed that an improved treatment should start with GraphoGame intervention, administered for at least 15 tasks and terminated by the 25th task, without significant loss in the final gain on phonemic decoding fluency. The treatment should conclude with PREP remediation to boost word reading fluency. Another interesting finding is that GraphoGame seems to facilitate more the improvement of phonemic decoding fluency skills, and that children need to have some basic word reading skills prior to remediation in order to gain from remediation on word reading fluency. Computer-assisted remedial reading interventions can be considered as effective supportive instruments for struggling readers, if they are theory-driven and evidence-based and part of the daily classroom routines. Results emphasize on the need for devising such remedial schemes, if we wish to determine strong effects on literacy. For more information, please contact Christiana Ktisti (@: christianaktisti@yahoo.gr) or Timothy Papadopoulos (@: papadopoulos.timothy@ucy.ac.cy), Department of Psychology and Center for Applied Neuroscience, University of Cyprus. The United Nations Educational, Scientiﬁc and Cultural Organization has made an agreement with the University of Jyväskylä about a UNESCO Chair on Inclusive Literacy Learning for All. The University has appointed Professor Heikki Lyytinen as UNESCO Professor to work for this global goal, and the Agora Center coordinates the actions. Recent reports of international development have revealed new crises in African schools. The number of children with school access has increased but actual learning outcomes are poor or non-existent. Globally 130 million children have remained illiterate despite several years at school. Even graduating primary school does not ensure that basic literacy skills have been acquired. While there are multiple reasons for these shortcomings, it is obvious that learning outcomes will not improve without stronger emphasis on evidence-based policies, scientifically valid instruction methods and effective teacher training programs. The mission of the new UNESCO Professor Heikki Lyytinen is to help children globally, specifically in Africa, to learn to read. Although it may seem surprising in the African context, the new approach for promoting literacy and providing learning materials for children and training materials for teachers is by using mobile technology such as mobile phones and tablets. It is acknowledged that in Africa most people use mobile phones for reading and writing. Very few have books but majority have mobile phones and are increasingly using the internet with them. – Information on learning to read and reading materials in African languages should be available for free. This can be best secured if we use the modern mobile technology, Lyytinen confirms. Mobile game-based learning is also a known Finnish strength. For this purpose, the GraphoGame™, a mobile game-based learning method is developed by Lyytinen’s team in the Agora Center of the University of Jyväskylä, together with the Niilo Mäki Institute. The method has been proven efficient already in Finland nationally, and in several other countries in pilot studies. The method is based on new scientific understanding of learning to read: literacy instruction methods need to be language-specific and matched with the type of orthography in each language. There are many challenging factors in African schools but lack of scientific knowledge should not be one them. Quality in education cannot be improved without capacity building in human sciences. Scientific research on learning has to happen in Africa by African people to ensure that the results are meaningful for the local societies. – To reach our goal, we have established the GraphoWorld Network of Excellence together with top researchers throughout the world, says Professor Lyytinen. – However, our goal is enormous and we are constantly seeking for additional support and resources. Welcome to join this collaboration and dialogue on language, literacy and learning, and ICT-solutions for promoting literacy in African languages!